Come to our events in Fond Du Lac, WI. 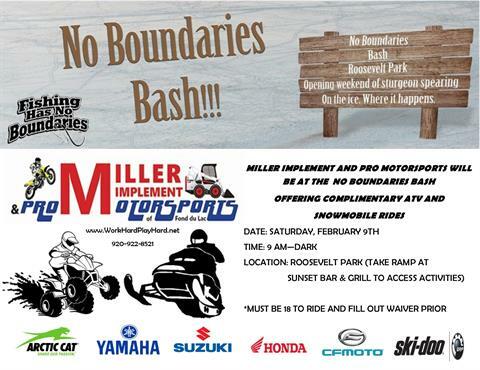 Overview: Miller Implement and Pro Motorsports will be out at Roosevelt Park for the No Boundaries BASH! We will have complimentary ATV and Snowmobile rides. We will be out there from 9 AM until dark. Come visit us and test out our many different makes of ATVs and Snowmobiles from: Can am, Honda, Yamaha, Suzuki, CFMoto, and Arctic Cat. There will be many other activities happening during this event as well. Open to everyone! !